Super Bowl LIII (53) was the culmination of the NFL season and the AFC representatives; the New England Patriots duly crowned world champions after defeating the NFC’s LA Rams in an unexpectedly low-scoring contest. For those who might have been tuning in to sample the annual spectacular for the first time, here’s a beginner’s guide to American Football, in readiness for the new season that begins in September. 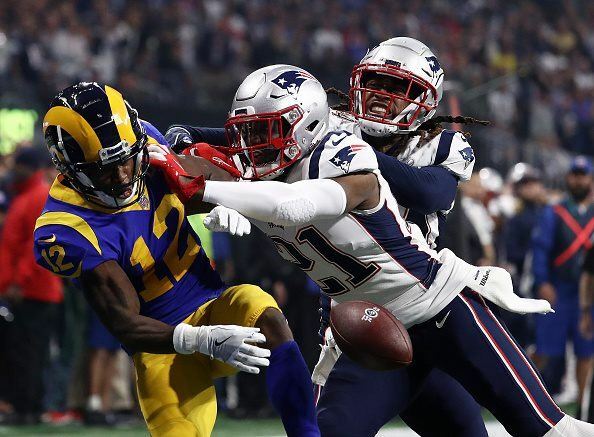 Patriots safety Duron Harmon blocks the Rams' Brandin Cooks' attempt to receive a pass, in the second half of Super Bowl LIII. There are 32 NFL teams or franchises, split into two conferences: the AFC and the NFC. Each conference has four divisions, split under broad geographical lines. They are designated the North, South, East and West divisions, and each comprises four teams. The regular season lasts for 16 games played over 17 weeks, as each team has a bye week. A side will play each of their three divisional rivals once at home and once away, with the remainder of the schedule comprising ten games against teams from other divisions from either conference. Therefore, a side will play 13 of the possible 31 rivals in any one regular season. The most successful sides then take part in the postseason fixtures, the Playoffs, to determine the champion of each conference, who then meet in the Super Bowl. All four divisional winners are guaranteed to participate in their conference’s postseason, and they are seeded from 1 to 4 based on their regular season win/loss records. Two remaining “wildcard” teams with the best record, who were not divisional title winners, complete the six Postseason teams from each conference and are seeded 5th and 6th. Firstly, the wildcard round, where the 3rd seed hosts the 6th seed and the 4th seed hosts the 5th. Next comes the divisional round, where the number 1 seed has home advantage against the lowest remaining seed, with the number 2 seed hosting the next-lowest. And finally, the championship round where the highest-seeded surviving team again enjoys home field advantage, before the conference champions of the AFC and the NFC then play each other in the Super Bowl. The game is played on a pitch that is 100 yards long, and is book-ended by scoring end-zones. The overall aim is to advance the ball towards and ultimately into these end-zones, by either passing the ball through the air for a team mate to catch, or running with the football. The quarterback, in conjunction with the team’s coaches, takes the decision about whether to call a running or passing play, and he has a maximum of four possessions to make a gain of at least 10 yards. If he is successful, his team immediately receives a fresh set of four 'downs', and the team attempt to advance further towards their opponent's end-zone. Meanwhile, the quarterback is protected by his offensive line – a group of players who attempt to block the efforts of the opposing pass-rushers to get to the quarterback, and prevent him either passing the ball to a tight end or wide receiver, or handing it off to a running back. A flying Steven Nelson is powerless to stop wide receiver Phillip Dorsett catching a 29 yard touchdown pass, during the AFC Championship Game. 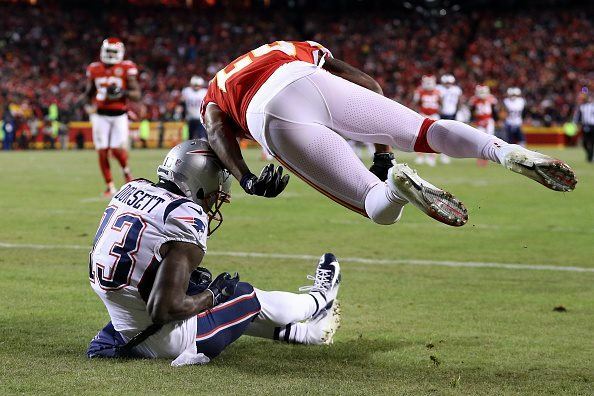 The Patriots beat the Kansas City Chiefs 37-31 to progress to the Super Bowl. A touchdown is scored by running into, catching and running into, or catching the ball inside the opponent’s end zone, and is worth six points. A further point can be added by kicking the ball between the uprights from 33 yards, or two extra points can be added by advancing the ball via a run or pass into the end zone in a single play from the two-yard line. Alternatively, if rarely, two points can be scored by tackling an opposing ball carrier in his own end zone. If the team is not successful in advancing the scoring drive, the ball is either punted forward on 4th down, a field goal is kicked for, or possession is turned over to their opponent if the 4th down play fails to gain sufficient yardage. A field goal, worth three points, can be scored by kicking the ball through the uprights, if a scoring drive has stalled. The best college players enter the NFL via the annual draft, when the side with the worst record from the previous season is allowed first choice of the talent available. Along with a salary cap, this attempts to ensure that the richest sides do not dominate and a side that has performed poorly can gradually improve into contention in following seasons. Because of this emphasis on keeping things competitive, a team such as the Philadelphia Eagles can finish bottom of their division one season and win the Super Bowl in the following 2017 season. Inevitably, some teams will use innovative coaching, good drafting strategy and skill players with great longevity to overcome these inbuilt advantages that are given to the weaker sides. For instance, this year’s Super Bowl champions, the New England Patriots, have enjoyed almost unbroken success under coach Bill Belichick since they drafted quarterback Tom Brady in the 2000 NFL draft. But they are the exception. The current NFL is a pass-friendly league, where games can be high scoring and the ability to pass the ball well or defend against the pass is essential to success. Tactical matchups that pit one team’s strength against another side’s weakness often leads to a fascinating mixture of thrust and counter-thrust, breathtaking skill and athleticism and – the Patriots aside – a constant rotation of teams in contention for Super Bowl glory.